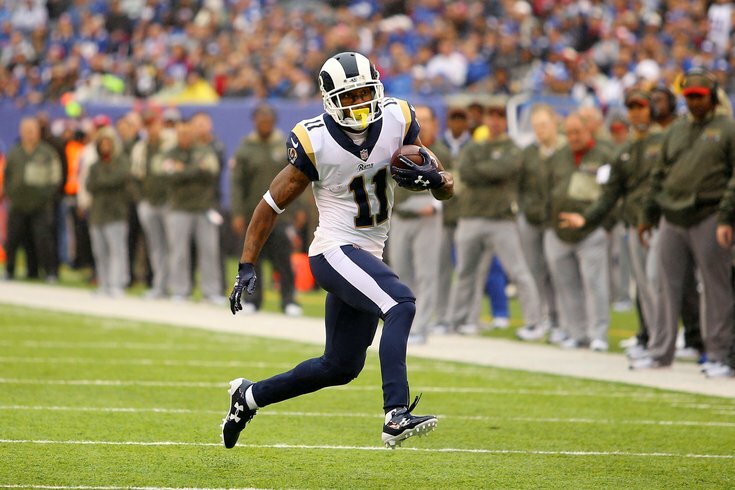 Tavon Austin has incredible athletic ability, but he has fallen short of expectations in the NFL. In previous offseasons, Howie Roseman and the Philadelphia Eagles have been very active in free agency. This offseason, I don't expect the Birds to be anywhere near as active, because (a) they don't have much in the way of team needs, and (b) they don't have money to spend. While you won't find guys like Alshon Jeffery on the list below (like you did last year), Roseman could be active on a smaller scale, finding low-cost role players. Like we had in version 1.0, here are three potential bargain bin players that I believe make sense for the Eagles. The Rams are reportedly going to either trade or cut Austin due to his lack of production and an $8 million cap charge this season. I can say with a high level of certainty that nobody is trading for Austin and his bad contract. When Austin becomes available, if he's willing to play for "show me" money, I can see the Eagles having interest in him as a role player on offense, in the same mold of Josh Huff, who Doug Pederson seemed to have a plan for in 2016 before he was released after an arrest. Austin could also serve as a returner, an area of need for the Eagles this offseason. Austin has one of the most impressive college highlight reels I've ever seen. His ability to make defenders miss in the open field, and the breakaway speed he possessed when he turned on the afterburners was special. That's why he was the eighth overall pick in the 2013 NFL Draft. For whatever reason, Austin's skills did not carry over into the NFL, and he did not become an impact player. However, in a diminished role, I can envision the the Eagles' offensive brain trust finding ways to utilize Austin's dynamic raw abilities. On a side note, the Eagles are well aware that they are going to be earning compensatory picks next year for losing free agents this offseason. The signing of Austin would not count toward the compensatory pick formula, because he will have been cut by the Rams. Flowers ran a 4.51 in the 40 at his Pro Day in 2014 and up until this season, had mainly been a special teams contributor. After getting on the field in the regular defense with New England this season, he showed that he has some upside at age 26, particularly in coverage. Of course, he'll have to stop being salty, and get over the fact that Clement's catch was indeed a catch. McDonald isn't any good against the run, and he's getting up there in age at 31 years old, which should make him a cheap option in free agency. So why would the Eagles have any interest? Well, he can still get after the passer. In his last 60 games, McDonald has 19 sacks. That equates to about five sacks per season, a nice total for an interior defensive lineman. The Eagles are likely going to lose Beau Allen in free agency, and while McDonald won't replace all the things that Allen does, he could serve as a role player on the interior of the Eagles' defensive line, as they seemed to lose confidence in Destiny Vaeao as the season wore on. Did I mention already that the Eagles are very unlikely to be big players in free agency this offseason? Anyway, I'll just reiterate that here. UPDATE: With the Eagles' trade for Michael Bennett, McDonald now makes no sense whatsoever.